Prepare 7" round pan by lining with baking paper. Hand whisk egg yolks with sugar for about 1 min, then add in pandan juice, coconut milk & oil, mix well. Fold in sieved cake flour until forms batter. Another mixer bowl,whisk egg whites until foamy, gradually add in the sugar, whisk until near stiff peaks form. Gently fold beaten eggs white form into egg yolk batter in 3 batches until fully combined. Pour batter into pan.Tap the pan a few times on table top to get rid of any trapped air bubbles in the batter. Bake in preheated oven for 160 deg 55 mins or until cooked ( when lightly pressed, the cake will spring back ). Remove the cake from the pan and peel off the baking paper.Leave to cool. Place cake ( upside down ) on a round cake rack and cut 3 horizontal layers.Leave aside. Whisk B together and strain mixture. Stir A together in a pot over medium heat until boiling, low the heat, pour in B and hand whisk cook over moderately low heat until the mixture thickens and boils.Off the heat. 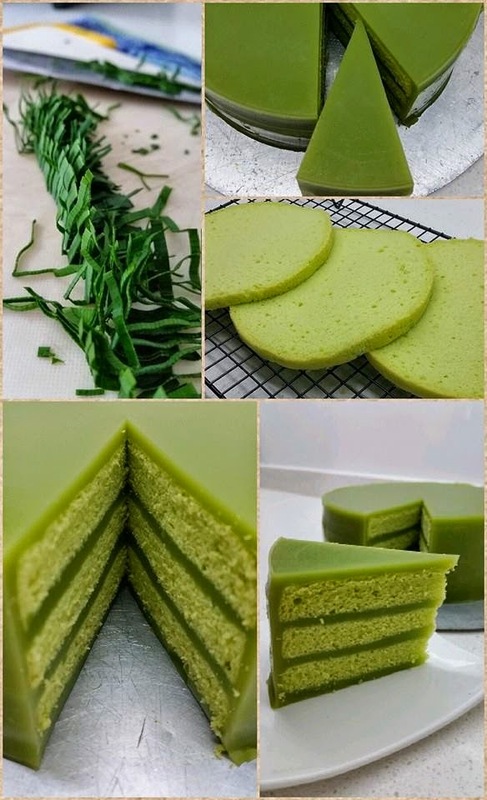 Pour 140gm of pandan kaya over the loose base pan, use spatula to spread out.Place the bottom layer over,lightly pressed and pour 140gm pandan kaya over,lightly pressed, use the spatula to spread out,place the middle layer of cake on it and repeat until all layers used up. Chill the cake in the refrigerator to set for 3-4 hours or overnight before removing the pan. Smoothen the sides with a knife and serve chilled. *Choose about 8-10 pandan leaf that is very green in colour. This recipe I did some adjustments, the original recipe was from my fb friend (HsHs Vivi).